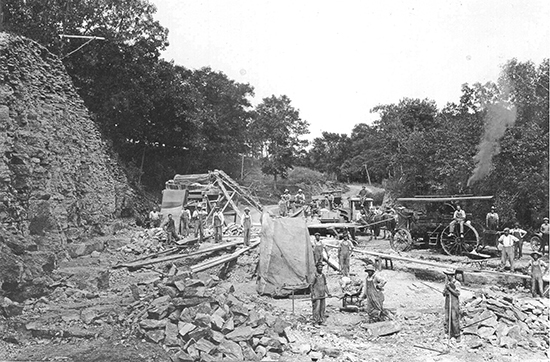 Duane Fenstermann of Decorah submits this historic photograph from the construction of the Locust Road back in the day. A steam-powered vehicle, horses and a lot of manpower appears to be hard at work in the photo. No other data is available on the picture. Any identifications or other information is appreciated. EIGHTY YEARS AGO: The Ossian High School girls’ basketball team won the right to represent Northeast Iowa in the State Girls’ classic March 9-11 in Des Moines. The people of Ossian are showing their true colors and support their team 100 percent with their continued presence and cheering. Ossian won a big game over Delhi in a thriller – final score 39 to 37, and then the team won a super thriller over Waterville in the very next game. Final score for the game vs. Waterville was 39-37. Then Ossian clinched the tourney with a 53-46 win over Stanley in an almost unbelievable exhibition of fine basketball. EIGHTY YEARS AGO: Ice skating races sponsored by the Decorah Junior Chamber of Commerce will be held next weekend, weather permitting. Fancy skating for boys and girls ages 12 to 17 will be combined with fancy skating for those over the age of 17. Around-the-rink races will be conducted in various categories. Miss Phyllis Dahle and Mr. W.E. Scott have offered to give a demonstration of their fancy skating prior to the event. A “sound truck” will be parked to broadcast music during the program. …A father and son who have been living around the Highlandville area since October have been picked up for being grifters in the Fayette and Winneshiek county area. EIGHTY YEARS AGO: FRONT PAGE NEWS from 1939 – Eggs at the Ness Grocery are now 17 cents a dozen – not 19 cents per dozen as was previously announced in the paper. …Chester Ruffridge, formerly of Locust, was badly cut about his hands the other night when he broke down a glass door to rescue his sister and two children and a friend from the second story of his flaming pool hall in Caledonia. Leaking gasoline from the stove caused the blaze. EIGHTY YEARS AGO: All the discarded Christmas trees from the area will make a big bonfire over at the Skating Rink this weekend. The numbers of trees brought down to the rink will decide on the size of the fire. …FRONT PAGE NEWS from 1939: A woman resident of the south part of Decorah was arrested by Night Watchman Herman Tavener at two o’clock the other morning. She pleaded guilty to being drunk and disorderly. She is nearly 35 years old and reportedly has some marital difficulties. In view of the fact that she has two children, a boy of age 7 and a girl of age 3, her sentence was reduced to $25 in fines and a suspended 30-day jail sentence. EIGHTY YEARS AGO: Folks in this area are sure enjoying the new arches of evergreen with lamps in the center which have been put up on several local street corners as the decorating of the Decorah business district reaches completion. Lights will be turned on this weekend to add a real yuletide spirit to the displays. …Iowa farmers who have kept within their corn acreage allotments will be able to obtain a 57-cent corn loan upon their 1938 corn crop early this month. Local farmers are urged to take full advantage of the corn loan offering. With these corn loans available at 57 cents a bushel, farmers can buy back their corn and feed requirements at around 30 cents a bushel. …Last week, a big group of farmers from several area townships met over at Nordness and took steps to organizing a cooperative under the REA. EIGHTY YEARS AGO: During the recent Decorah vs. Charles City football game here, a new experiment for the enlightenment of spectators was tried. The experiment was in the form of a “play-by-play” description of the contest, which was broadcast through a public address system furnished through the courtesy of the Dewey Tatro Company. …E.F. Sellman of Decorah recently closed a deal with Charles Taeger for purchase of the fine two-story corner brick building west of the Grand Theatre – the former A.R. Severson Building. It is occupied by Davis Cafe, McArthur’s and Daly Radio Service. The flat above the store is occupied by Mr. and Mrs. McArthur. EIGHTY YEARS AGO: Roscoe Wicks of Burr Oak recently marketed 80 quarts of fine, homegrown strawberries in Decorah. He picked them at his place on Oct. 30. He has marketed more than 2,400 quarts of those delicious ever-bearers, all picked on his farm since August 1. …Rev. Elwick of Decorah will be preaching at the Bur Oak Church on Sunday because Mrs. Prust is sick with quinsy and they are not able to determine whether or not she has scarlet fever. Clinton reportedly has been having scarlet fever the past three weeks. And several other cases of the scarlet fever are reported in the area. EIGHTY YEARS AGO: The beautiful new church chandeliers and cemetery cross were blessed last week at St. John’s Church and St. John’s Cemetery over at Fort Atkinson. Numerous members of the church made the donations to make the additions possible. …Currently there are 50 CCC boys quartered out at the Decorah camp at the fairgrounds remodeling old buildings, erecting new ones, installing a connection with the city sewer system and making other preparations for removal of the Cresco CCC camp of 250 members to Decorah in late November. EIGHTY YEARS AGO: Willie Barth, who hails from Canoe Township, has won the county corn husking title. Mrs. Julius Selness is the woman champion. Glen Reed’s Team won the team division. More than 1,200 people attended the contest. The local businessmen of the area gave out prizes. Through the hospitality of Mr. and Mrs. Newhouse, all of the huskers enjoyed a fine meal following the contest. Barth had a net load of 1,435 pounds. Second place honors went to Roy Fleming of Bluffton. Larry Wenthold won third place. EIGHTY YEARS AGO: The Newhouse farm near Burr Oak will be the stage for the big corn husking contest in these parts of the country this month. Refreshments will be served by the capable ladies of the Rural Women’s Chorus. A total of 15 huskers have made entry for the countywide event so far this week. A loud speaking system will be available courtesy of the Dewey Tatro Company of Decorah. …Ed Shima of the Sugar Bowl Ice Cream Factory here in this city, recently attended a manufacturing association meeting in Cleveland, Ohio. EIGHTY YEARS AGO: Word on the street is there may soon be another CCC (Civilian Conservation Corps) camp here, with workers taking up soil conservation work at farms of Winneshiek and adjoining counties. The good word is that the current CC buildings on the fairgrounds have been kept in good repair and are practically ready to move into. …Prof. S.S. Reque gave an interesting pep talk on the many points of historical interest in Winneshiek County during the fall opening luncheon of the Decorah Chamber of Commerce. EIGHTY YEARS AGO: The farm residence of Mr. and Mrs. J.C. McArthur, situated 12 miles northwest of Decorah, was destroyed in a fire last week. All of the contents of their home also were lost, while the owners were away attending the county fair. The origin of the blaze remains under investigation. EIGHTY YEARS AGO: A rattlesnake over four feet long with 12 rattles was killed last week by courageous Inga Exey from over near Freeport. She reportedly grabbed a stick, hacked the snake where it would do the most good … and that was that. …Now showing at the theatre in Ridgeway – “Bringing Up Baby” starring Cary Grant and Katharine Hepburn. …The big Winneshiek Fair is being put on here in Decorah Aug. 18-21, 1938. Acrobats will do the famous pyramid pose during four nights of stage performances. Another big highlight for fairgoers this year will be the annual milking contest in front of the grandstand. EIGHTY YEARS AGO: FRONT PAGE NEWS FROM 1938: A jack rabbit jumped through the windshield of Adoph Hayek’s truck the other day while he was hauling his cream route for the Calmar Creamery. The rabbit died on impact, and Mr. Hayek received minor cuts to his face from flying splinters of glass. …A total of 105 student applications have been received at the Luther College business office – 45 girls and 60 boys. This is the largest number on record at this date. EIGHTY YEARS AGO: Bertha Nesheim has opened a business called the new Green Parrot Tea Room on State Road (old Highway 52 and now College Drive). The advertisement from 1938 reads: “You are cordially invited to visit the finest eating place in this territory.” The new Green Parrot boasted a private dining room for special parties. Opening day was mid-July, 1938.